Map It! 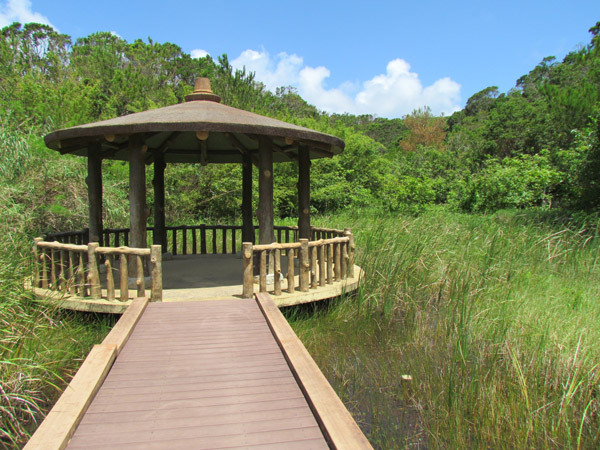 Okinawa: "A School of Killifish Pond (Kanna, Ginoza)"
This is a very quiet and serene pond in Kanna, Ginoza. 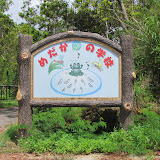 It is adjacent to the Kanna Dam Family Park. There are about five stations on the pond where you can view different areas of the pond. Each station is connected by a wooden walkway (See photo album above). It is a nice place if you just wish to enjoy the tranquility and feel the nice breeze as you rest underneath one of the shaded stations. It is not a bad place to read a book or write a diary as you take in the surrounding nature (Note: there are no seats underneath the shaded stations, but the pillars make for a nice backrest). The name 'School of Killifish' is actually a name of a famous Japanese nursery rhyme. In Roman characters the name is pronounced in Japanese as 'Medaka no Gakkou'. Killifish are a group of small fish that live in fresh water. They are found all over the world except Australia and Antarctica. Sometimes you hear them referred to as 'guppies'. The nursery rhyme talks about the Killifish playing happily together like little children, but you can't tell which is the teacher and which are the students. If you wish to see a transcript and translation of the lyrics, please go to Mama Lisa's World. You can also listen to a sample on YouTube. What to bring. A camera, water, book and a bento lunch box (optional). Other places of interest nearby. Kanna Dam Family Park, Kanna Dam, Ginoza Belly Button, Kanna Dam Watch Tower.